A commonly used color scale to evaluate the pollution levels in both water and waste water is the Platinum-Cobalt (Pt/Co), Hazen or Apha color scale. Pt-Co units can be abbreviated as PCU. 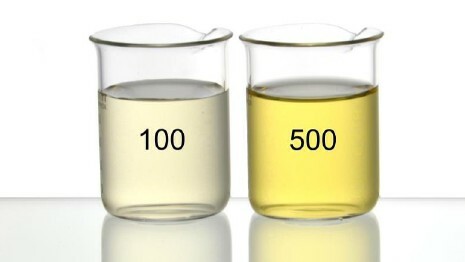 Additional application areas for the Pt-Co/Apha-/Hazen color scale include polymer additives, resin solutions, and solvents such as hexane, glycerol, methanol, mineral oils etc. As a guide, liquids with a color of <15 PCU are generally not detectable, while tea has a color of about 2500 PCU. While there is no health based guideline limit for drinking water, an aesthetic limit has been set to minimize consumer concern at < 15 PCU.